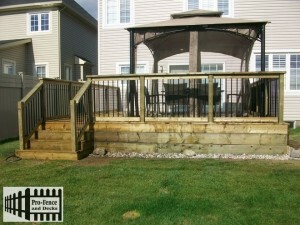 Pro-Fence and Decks Inc. Wood Decks Ottawa Installer/builder/contractor Ottawa. 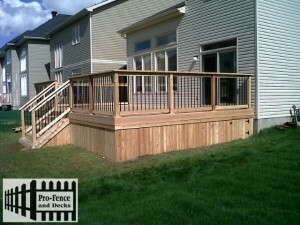 Pro-Fence and Decks Inc. specializes in custom wood decks in the city of Ottawa. Wood Decks are the most common decking choice because they are very unique and the styles are endless for wood decking. They are strong, durable and carry long time beauty to your property. 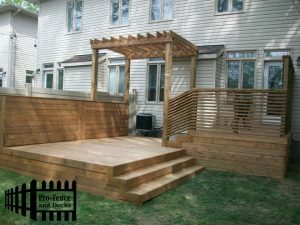 Western Red Cedar deck creates a high quality deck product for your property. When it comes to decking Western Red Cedar still remains the top choice in Ottawa for wood products because of its natural beauty, durability and appeal to any home. All of our Western Red Cedar that we install are First Grade Premium Lumber. Pressure Treated Decks remain another popular choice for decking in Ottawa. This is one of the most inexpensive materials in the market. It is a very durable product. With maintenance every 2-3 years it will give it a longer life span. IPE Decking is a product that you don’t have to constantly maintain or replace. This product is the finest quality wood available. IPE is an exotic hardwood that is naturally resistant towards rotting or decaying. IPE Decking is 3 times stronger than Cedar wood and has a lot of beauty.